Rooibos is naturally caffeine free, has very low tannic acid and is packed with minerals. We produce the liquid extract here in USA with a patented extraction method that uses no alcohol and very low heat, thus keeping all the nutrients and enzymes alive. The antioxidants in this extract are extremely high, 50 times more than green tea. Just a dropper full of this extract in your drinking water, smoothie or juice will give you the antioxidant boost daily. 2-3 droppers 1 to 2 times a day. Shake well. A proprietary blend of Kosher Vegetable Glycerin and Purified Water (pH neutral), and rooibos red tea leaf. 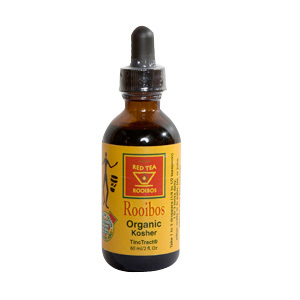 Rooibos Liquid Extract is shipped in a discrete, unmarked package. Orders are processed immediately and usually take about 3 to 5 working days to be received. We do ask that you try it for 2 to 3 weeks to feel the full effects. Any information received is used only for order processing and shipping purposes. Your information, such as e-mail address, will never be disclosed to a third party.